In (very) early 2018 fantasy drafts so far, 12 of the first 16 picks are running backs. The other four are receivers. In 2017, five receivers were taken in the first round alone, and in 2016, we saw an average of six receivers come off drafts boards in the first round. 2016 was arguably the height of the “Zero RB” approach to fantasy drafting, but after the strategy burned some people in 2017, the fantasy community at large seems to be shunning receivers in favor of “safer” options — i.e. the “tried and true” running back position. Is the fantasy community undervaluing wide receivers as the result of an overreaction to a down year from the position in 2017? Definitely. For most of the above categories, receivers were roughly 7-15 percent worse in 2017 compared to their previous three-year averages. 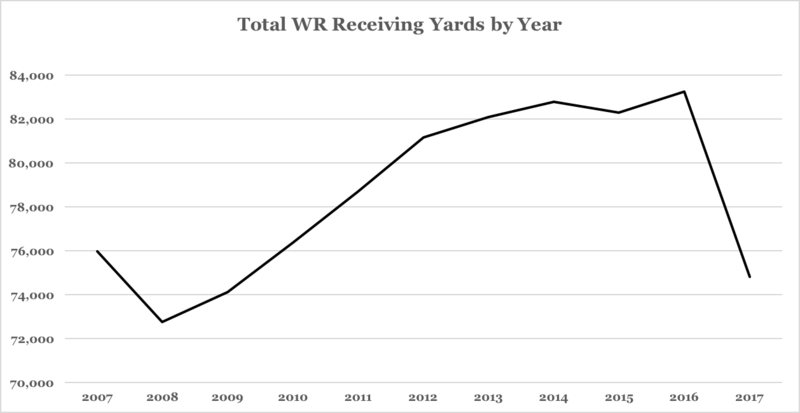 But wide receivers, in aggregate, didn’t just buck three-year trends last year. Wideouts nearly reached PFF-era (since 2007) lows in 2017. Most categories — including total targets, yards, touchdowns, total fantasy points, touchdown rate, and fantasy points per target — were the lowest they have been since at least 2009. Here are a few charts to help depict the trends and drive home just how much 2017 was an outlier. League-wide offensive touchdown scoring in 2017 was the lowest it has been since 2008. Between 2010 and 2016, wide receivers caught about 41.5 percent of those scores — but in 2017, that number dipped to 38.8 percent. So not only did all players score fewer touchdowns this year, but wideouts also scored a fewer percentage of those touchdowns. We shouldn’t ignore a decade-long trend because of a one-year anomaly. So what’s the takeaway here? We know that 2017 was a down year for receivers. But we shouldn’t have such a knee-jerk reaction to the blip. To be clear, I’m not talking about any specific wide receiver here. There’s no point in harping on specific average draft position data in the middle of February. We mentioned the “Zero RB” draft strategy earlier in the piece. Fantasy footballers at large seem to have given up on the strategy for 2018 (at least among early drafters/mock drafts) — but that might not be the smartest idea. In fact, given that the consensus (“wideouts are now bad!”) is really nothing but an overreaction to 2017 suggests that the “Zero RB” strategy may be more fruitful than ever in 2018. Someone drafting in the middle of the round could land Antonio Brown and Julio Jones to start their draft — an unthinkable combination in previous years. The “return of the wide receivers” will be a major 2018 storyline — but it really shouldn’t come as a surprise. 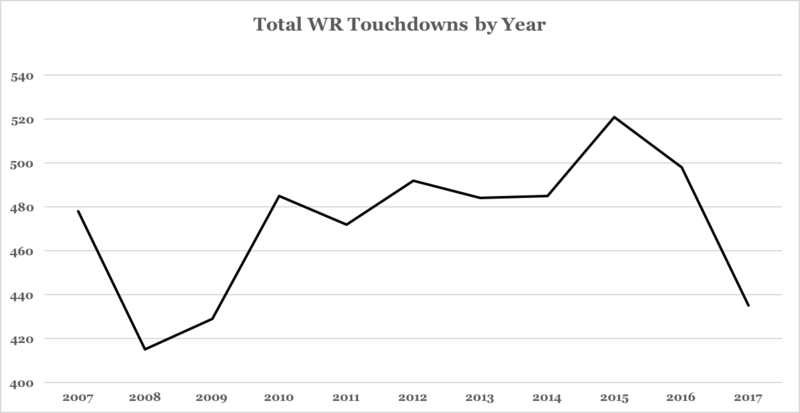 Decade-long trends reveal that wideouts have been climbing in all relevant fantasy categories, and that 2017 was simply a down year. It’s hard to envision a scenario in which receivers don’t rebound in a big way in 2018.